THIS NEW ONE DROP VALUE PACK WILL BE SHIPPED. Disinfects Bacteria, Pathogenic Fungi, Virus, and Mold. Why risk touching the Tick? Why risk using the OLD tweezer-method that could leave the Head Embedded? Why risk not properly disposing of the Tick? 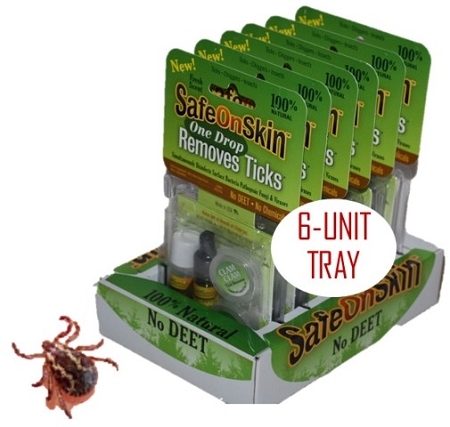 Why risk not safely retaining the tick in a dedicated Tick Specimen Vial™ such that it can be examined by a doctor for Lyme disease or bacteria? It's time to get the New Revolutionary CureCeutiCals® SafeOnSkin™ - One Drop Removes Ticks Kit™ - VALUE PACK. 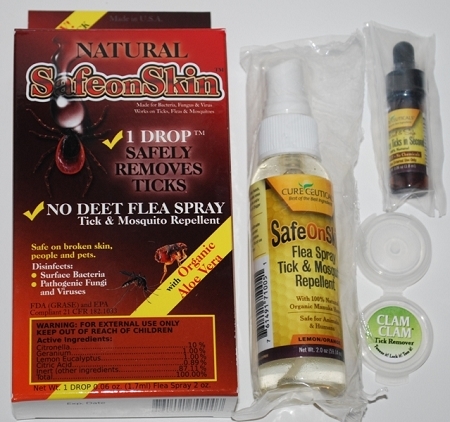 The Natural, Hygienic way to Safely Remove and Dispose of Ticks. If you are exposed to ticks, keep this product on hand. Don't wait until you get a tick. One Drop on tick - removes tick. Apply frequently (see package) to minor cuts, sores, and bites. Apply to broken skin and other minor skin irritations. Just One Drop causes the Tick to gently and immediately release its position and pull-out its head on its own. 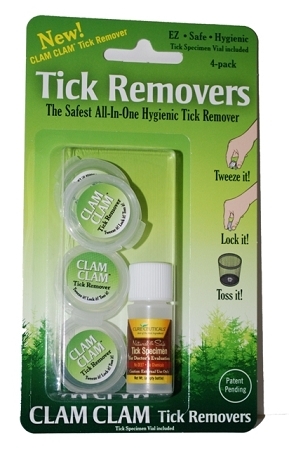 Tick becomes paralyzed and is then Tweezed-up (just like a using a tweezer) using the CLAM CLAM™ Tick Remover and automatically locked inside the integrated container - see below. Tick can be safely disposed of or retained as a specimen for a doctor's evaluation. IMPORTANT: Keep a CureCeuticals® SafeOnSkin™ One Drop Removes Ticks (Kit) on hand so you'll have it immediately when you need it. The sooner you safely remove a tick, the better! One Drop Kit is well worth the money! One vial goes a long way! Just one drop immediately causes the tick to pull its head out and becomes paralyzed. 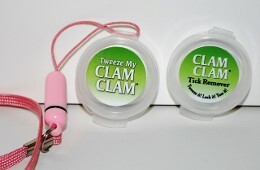 Use the CLAM CLAM™ Tick Remover to secure the tick and lock it inside forever. This tick has no chance of escaping and dies in minutes inside the CLAM CLAM™ without you ever having to touch the tick with your hands. THE NEW VALUE PACK WILL BE SHIPPED WHEN THIS PRODUCT IS ORDERED. One Drop kit™ is substantially more effective than a tweezer, tick tools, or any other known tick device. One drop kit™ effectively renders all those methods obsolete. You never have to touch the tick with your hands. 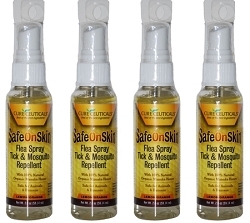 CureCeuticals® SafeOnSkin™ One Drop is the easy, safe, hygienic way to remove a tick and disinfect where the tick was lodged with its powerful natural ingredients. It simultaneously disinfects surface bacteria, pathogenic fungi, and viruses. 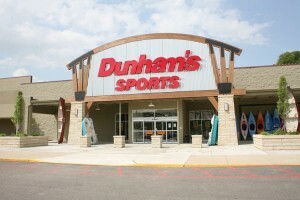 Natural and Completely Safe – Made in USA. THE SIMPLEST, SAFEST, MOST HYGIENIC NATURAL WAY TO REMOVE A TICK AND SAFELY AND PROPERLY DISPOSE OF IT. Research shows that the sooner you remove a tick the less chance of tick disease (Lyme disease) or infection. Caution: Do not use on felines or birds if allergic to essential oils. Do not use if you are allergic to natural essential oils. 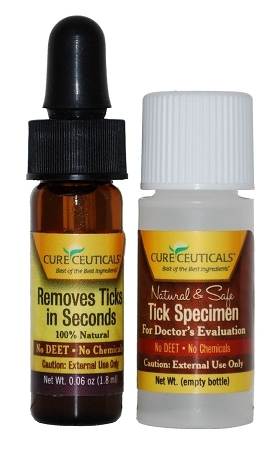 Apply CureCeuticals® SafeOnSkin™ One Drop Removes Ticks solution directly on tick (2-3 drops for large ticks). Wait 30-90 seconds and use CLAM CLAM™ All-In-One Hygienic Tick Remover to remove tick from skin or animal without touching the tick with your hands. Apply SafeOnSkin™ One Drop solution to the area where tick was removed; at least one-drop per day for seven days. Always wash your hands when you are finished. See package for more details.